I really do enjoy running outside. But I have a problem when I do. I am, without question, a part of the MTV generation 1.0. I was part of that first wave of young kids gawking at the TV when the Buggles popped onto our screens and Martha Quinn & company began providing us with a 24 hour feed of music videos. I am firmly a part of the immediate gratification generation. As a result, I lack patience. There have been countless runs where I have said aloud that I was going for a long, SLOOOOOW run only to end up running a tempo run or faster. I’ll start slow, with every intention of keeping a relaxed pace, but all too often, I end up speeding up less than halfway through. At first it’s unintentional, but then I see the split on my stopwatch and it’s all downhill from there. I refuse to slow down. I’m starting to think that the injuries that I sustained in April and September were direct results of being impatient. Early on, a friend of mine pointed me to a couple of training sites that help you figure out what pace you should be training at based on past race performances. Before my personal triumph at the Chilly Half back in November, I had not run a race that extrapolated out to a 3:20 marathon or better (a BQ for someone my age). The best result I had put me at about a 3:32 marathon (the Chilly put me at 3:17). I didn’t want to hear that. The various sites would tell me that I had to run my long runs at a certain pace. They also said in bright, flashing, red letters that I needed to train at the level I was, and NOT at the level I wanted to be. I didn’t want to hear that either. I plugged in what the long run pace should be for a 3:15 marathon. I wanted room to spare. The resulting number still seemed slow to me. I could run 15 miles at a much faster pace (or at least, that’s what I told myself). I ignored the numbers. I would go out for long runs of 12 – 16 miles and run at close to marathon pace. I had to stop running for nearly 4 weeks (which quite honestly was probably not long enough). When I returned to running, I still didn’t heed the numbers and went out at paces that were where I wanted to be, not where I was. The result was a crash and burn at the Manchester Marathon. I held up great for 16 miles, hit a wall and then froze up at 20. I play back that marathon in my head from time to time. The first mile was a killer (the 3:30 pacer decided to go out at a 6:30/mile clip), and I probably didn’t hydrate properly, but the more I think about it, the more I believe that my training philosophy was all wrong. I was training where I wanted to be, NOT where I was. That’s impatience. That’s the Veruca Salt training method. So this year, starting today (an arbitrary day resolution), I resolve to be more patient with my runs. Run at the pace my racing legs say is where I’m supposed to be. I now have enough races under my belt that I should be able to comfortably rely on what the numbers say. If I do it right, run patiently, I have no doubt that I have a qualifier in me for October. I’m still going to run Hyannis (I think), but it’s going to be for fun. At least, that’s what I’m going to tell myself. I have a similar problem, but luckily for me it only manifests itself in shorter runs so hasn’t been a huge problem. I think the key of what you said is: “I was training where I wanted to be, NOT where I was.” I have definitely fallen into that trap from time to time, as well as others I know. That is one sure-fire way to get yourself injured! I think identifying the problem is a big first step to fixing it! Good luck! Good luck! I am astounded at the “instant gratification” my kids are accustomed to now (the guide on the tv screen telling them what’s coming, the ability to pause a show to get a snack, it goes on and on). Who knows what kind of runners they’ll be? (Of course, they can record their shows so they don’t miss them during their runs!). It sounds like you know what you need to do — take care of yourself so you can keep running! I did EXACTLY the same thing. I definitely was trying to train ‘above’ my ability. Luckily I didn’t injure myself. Good luck this year! 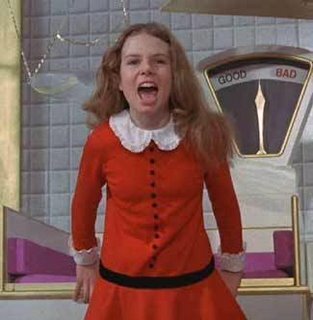 I’m looking forward to scheduling my marathon for 2010.
i’m a bad combination of veruca salt and that fat german kid. i’m not fat, thankfully, but i’m all about the rampant hedonism. my eating habits can sway towards the comfort foods. so, i’m impatient and impulsive. (and the fact that i usually need to watch a show when exercising…kind of makes me mike tv as well. i’ve hit the anti-exercising trifecta! ).